When you want a heart-pumping, fat-burning workout, sign up for one of our cardio workout classes. 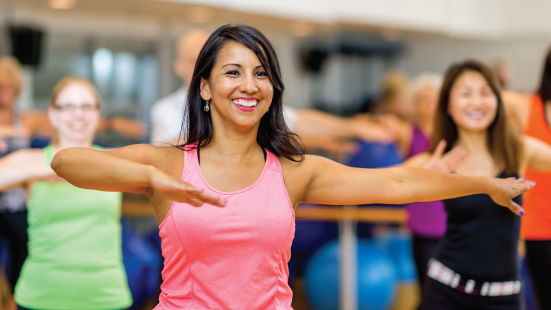 Our Group Fitness Instructors use a sports-oriented approach in our cardio-athletic classes, but they minimize the amount of choreography involved, so anyone can jump in and feel right at home. We offer aerobics classes, boot camp workout classes, cardio kickboxing classes, and sports conditioning classes. Sign up for the best cardio classes in Sacramento! Hungry for more? Explore more fitness classes to broaden your workout regime. This class gives you the HIIT you've been looking for. Short periods of a variety of cardio exercises alternate with strength exercises for an intense workout that anyone can do. This popular training program comes to life as our instructors teach you how to punch, kick, and block your way through a fun and challenging cardiovascular workout! Let our instructors take you on a cardiovascular journey! Pedal through flat roads, hills and valleys as you take your aerobic training to a new, fat-burning level! Take a dash of low impact aerobics; mix with a little dance choreography. Add in some funky lights and music and you have a heart-pumping class that is fun for the dance diva in everyone! Use the step platform to keep your mind busy and your heart pumping. This class has beginning to intermediate intensity and choreography. This is a good place for you if you know some of the basics and want to start increasing your stepping skills. This combo style class mixes up power, spin, step, sports, running, walking, kickboxing, strength moves, and relaxation. Designed to challenge all your aquatic exercise skills in shallow or deep water. Zumba® Find out why this class is sweeping the nation! Zumba combines Latin dance moves with hip hop, belly dancing and traditional fitness moves. Cardio intervals, motivating music and choreography that everyone can do will make you keep coming back for more.